David Patrick Stearns at the Philadelphia Inquirer selected the first full workshop of the opera Paul’s Case for his classical music ten best list for 2009. Stearns praised its “solid dramatic timing, compassionate characterizations, and huge potential.” The opera by Gregory Spears based on a story by Willa Cather was presented in September as part of the Philadelphia Fringe Festival by Center City Opera. The work is currently in development at American Opera Projects, having originated during the 2007-08 season of Composers & the Voice. Time Out/NY‘s review of the recent public workshop of Herschel Garfein’s Rosencrantz & Guildenstern Are Dead directed by Mark Morris and held at the Mark Morris Dance Center Nov 20-21, 2009. As Charles Jarden, general director of American Opera Projects, was introducing Saturday afternoon’s reading of Herschel Garfein’s opera-in-progress Rosencrantz & Guildenstern Are Dead, pointing out the emergency exits in the Mark Morris Dance Center, a mike came undone from its ceiling post and swung ominously like a noose. Such irony would not be lost on Tom Stoppard—nor, thankfully, was it lost on Garfein. His wry adaptation of Stoppard’s 1967 retelling of Hamlet through two of the play’s minor personages lacks some of the play’s absurd existentialism, but keeps at its heart many of the play’s trademarks—from Stoppard’s dialogue to the endless flipping of a coin to the famous game of questions. C&V alumnus Andrew Staniland will have his song “Blue” (2008) presented as part of Continuum’s first concert of its 44th New York season – NORTHERN EXPOSURES: Canadian Music – The New Individualists. The concert is Tuesday, December 8, 7 PM, at Americas Society, 680 Park Avenue at 68th Street. “Blue,” based on a moving poem of Walt Whitman, will be sung by mezzo-soprano, Abigail Fischer. The piece was developed during Andrew’s residency during the 2007-08 Composers & the Voice program at AOP with Fischer premiering the song. Looking for just the right stocking stuffer? 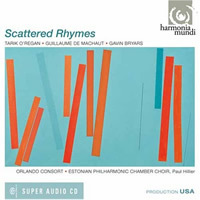 According to Allan Kozinn at The New York Times, “Scattered Rhymes” – the 2009 CD from Heart of Darkness composer Tarik O’Regan is the perfect fit. Ancient and modern mingle in this beautifully sung program. The title work, by the imaginative English composer Tarik O’Regan, is a (mostly) Petrarch song cycle, built on themes borrowed from Machaut’s Messe de Nostre Dame. A velvety account of the Machaut original is included, too, along with other works by Machaut, Mr. O’Regan, Dufay and Gavin Bryars. (Harmonia Mundi HMU 807469; CD); $23.98. Read the full list of notable CD’s from 2009 as chosen by classical critics of The New York Times here. Buy your copy of “Scattered Rhymes” here. You are currently browsing the Have a Voice blog archives for December, 2009.